A visit with Santa was one of the highlights for the kids at Canyon Cares Christmas. 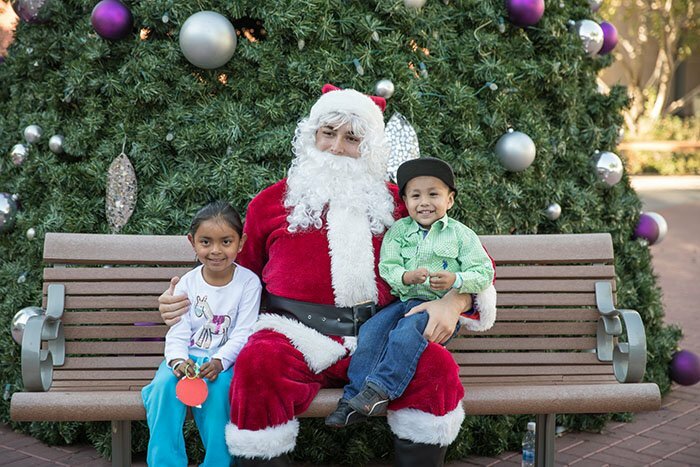 Hundreds of children, parents, staff and volunteers celebrated the joy of the season Sunday afternoon during Grand Canyon University’s Canyon Cares Christmas. 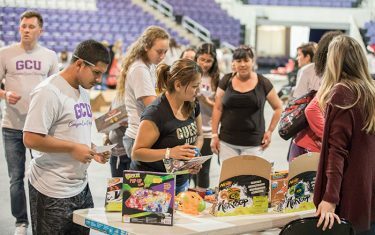 The happening draws hundreds of neighborhood families as well as children served by GCU’s refugee ministry, Spiritual Life and Local Outreach programs. Neighborhood children loaded up on stuff animals and other goodies. From babies to young teens, participants delighted in activities and games, photos with Santa, a large lunch and — perhaps the biggest attraction — gifts that their parents could put under the tree. 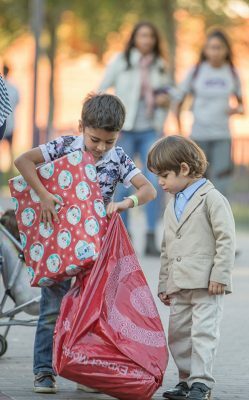 “These are the only presents they get,” said Margarita Artega, who has four children ages 5-12. Holiday music played on loudspeakers as youngsters kicked soccer balls and chased each other across the Quad. More than 300 volunteers were deployed to serve a hot lunch, organize games, wrap toys and help parents choose age-appropriate gifts from the multitude of options arrayed on tables. Parents could choose from a variety of gifts. “The more I learn about what GCU does in the community, the more I am blown away,’’ said Torrey Allen, a GCU Local Outreach coordinator. “It’s just a huge benefit for the community to know they are taken care of and to bless them during the Christmas season,” Spiritual Life Manager Braelyn Armenta said. 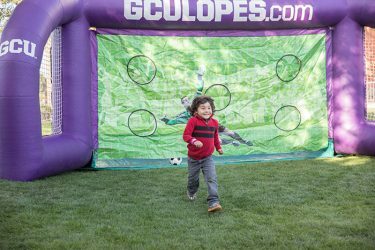 Members of GCU’s Events team were on hand to help organize the festive fiesta, which involved 137 families with 486 children, serving 700 lunches and coordinating the volunteers, according to Jennifer Girl, director of campus events. Santa Claus posed for pictures with children, many of whom were uncharacteristically shy in front of the legendary Christmas champion. 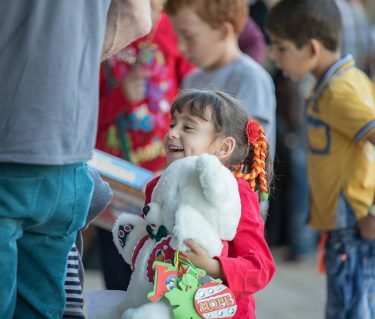 Parents entering the GCU Arena were treated to a Santa’s workshop-like experience as their eyes beheld hundreds of toys piled gaily onto tables and a small army of “Santa’s elves” who cheerfully wrapped parcels in bright paper. Some parents, such as Elli Garcia, were choosing gifts for as many as eight children. Garcia’s list included children ages 2-12. Judith Rubio and her three children, ages 4-12, were attending for the second year. “This means Santa is coming to our house on Christmas Eve,” Rubio said. Kicking around soccer balls kept the kids busy, too. Monique Flores said she was thrilled with the bike, scooter, basketball and paint set for her four children, ages 1-9. “The quality of the gifts is so good,” said a grateful Jose Munoz, picking up presents for five children, ages 4-12. “For my family, this means they get presents this year,” said Jesus Salgado, attending the event for the fourth year. His four children range in age from Angel, 1, to Jesus, 10.